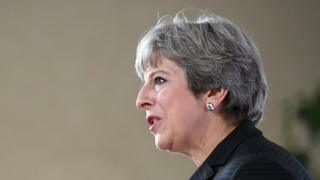 Prime Minister Theresa May has used a speech in Florence to set out the UK’s position on how to move Brexit talks forward. With further negotiations planned next week, what did her speech tell us about the sort of Brexit deal we might end up with? Reality Check correspondent Chris Morris has been scanning the speech. What’s the significance? It’s worth noting that a lot of Brexit supporters in the UK jumped on Jean-Claude Juncker’s State of the European Union speech last week – in which he set out an ambitious agenda of greater integration – as an example of why they wanted to leave in the first place. The PM picked up on this – we’re getting out of your way while you move in a different direction that we’ve never felt entirely comfortable with. That’s good for both of us she implied. It slightly ignores the fact that many EU leaders wouldn’t agree with Mr Juncker’s proposals – but it’s a point that will go down well on the Tory backbenches. What’s the significance? The tone matters here. Urging EU leaders to be creative, ambitious and to share a “profound sense of responsibility to make this change work” is a bit of a departure from the language in her last major speech on Brexit at Lancaster House in London in January. It contained warnings of “an act of calamitous self-harm” for the countries of Europe if they sought to punish the UK, and the famous assertion that “no deal is better than a bad deal” for Britain. The rest of the EU will take note of this more collaborative appeal but will also be watching to see whether the tone changes again in the prime minister’s speech to the Conservative party conference next month. What’s the significance? The prime minister is saying she wants to incorporate an agreement on EU citizens’ rights into UK law, and she thinks UK courts should be able to “take into account” the judgements of the European Court of Justice. It’s a real guarantee, she says: “We want you to stay.” The trouble is that it’s not what the EU is demanding. The chief EU negotiator Michel Barnier insisted in a speech yesterday that the Court of Justice should remain the ultimate guarantor of any agreement. The big difficulty here is that jurisdiction is a pretty black-and-white issue – there are few grey areas. 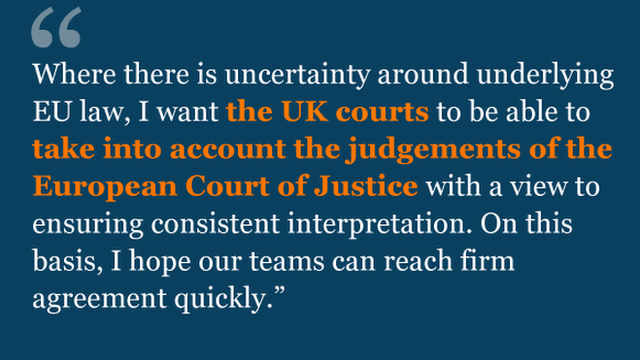 As things stand, the UK view is that British courts should have the final say, and the EU sees that as unacceptable. What’s the significance? So the Prime Minister has ruled out a European Economic Area-style solution to a future relationship (this would be like Norway – part of the single market but not part of the EU). Mrs May says it would still be too restrictive for the UK. And she ruled out an ambitious free trade deal like the one the EU has with Canada – it would take too long and would ignore the fact that we start from a position where all our rules and regulations are the same. So she wants a unique solution – a new deep and special partnership. But in this speech she hasn’t really given more details of exactly what that solution would be. What’s the significance? This is important. It means that during a transition period – the prime minister suggested two years as a possibility – all the rules will remain the same. That means payments into the EU budget, free movement of people and the jurisdiction of the European Court of Justice would stay in place. 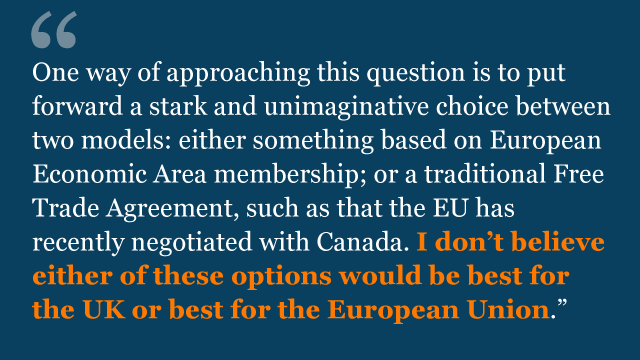 That’s always been the position of the rest of the EU – it now appears that the UK has accepted that there is no way round this. Mrs May confirmed that there will be no restrictions on EU citizens coming to the UK during the transition, but that after Brexit they will be registered as they arrive. 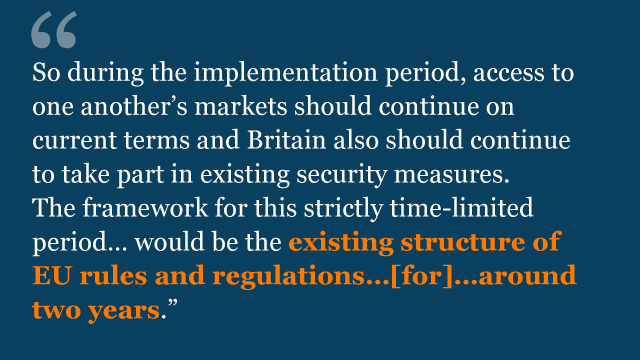 That is something that the UK could already do under current EU rules, but it never has done so. What’s the significance? The prime minister is trying to reassure other member states that no net contributor will have to pay more, and no net recipient will receive less, during the current seven-year budget period, which runs until the end of 2020. That suggests that the UK will provide the sum of roughly 20bn euros (£18bn) in the two-year transition period that it has now proposed. What’s not yet clear is whether the UK thinks these payments will also cover some of its outstanding debts – debts that the EU insists have to be settled as part of a withdrawal agreement. The rest of the EU will view the £18bn as payment for the UK being allowed to maintain its current role in the single market. Note she didn’t say “all” our commitments.